When Kyoto became the capital in Japan in 794, the town was built on a grid, on the model of Changan, the capital of Tang (current China). Current Kyoto has still the grid streets. The main streets are as the map below. And each compartment surrounded with the streets has the grids made by many narrow streets. Most of the minimum blocks are about 120-150 meters from north to south and about 70-100 meters from east to west. Thanksfully, most of the intersections are named after the streets as the following examples. In principle, the first half is the name of the street from north to south and the latter half is the name of the street from east to west. But there are several exceptions. 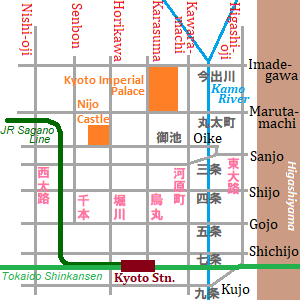 If you has gotten lost in Kyoto city, go to a nearby main intersection first. Check the name of the intersection, and you can probably find your position. In Kyoto, a children's song to learn the streets has been sung. The song includes the initial words of 18 main and small streets from east to west between Marutamachi Street and Gojo Streets.